Ready for another sweet potato recipe? While this is a perfect pie to make for your Thanksgiving festivities, it’s also a good birthday cake, according to my mother-in-law Paula. 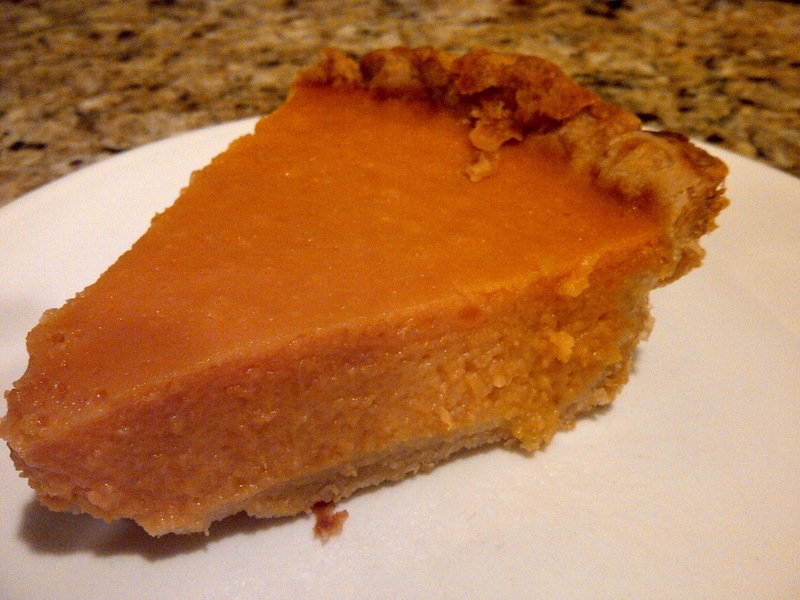 Sweet potato pie for your birthday? That sounds like an odd request to me, but perhaps that’s because my birthday is in March. I crave cheesecake, fruit tarts and the classic: chocolate cake. Paula’s birthday is today, so it’s quite fitting that she request this pie. A few days ago, Paula’s mother Boog came up to Dallas. Unfortunately she came up for a surgery, but to Paula’s surprise, she also brought birthday cake: sweet potato pie! Boog’s pie is great. While I loathe mushy potatoes like mashed and baked potatoes, I’ve come to LOVE anything sweet potato-related! This pie is just that, light, sweet and perfect. This is also one pie that is semi-healthy to eat. Sweet potatoes have sooo many health benefits. They are loaded in vitamin B6, are a good source of vitamin C, contains vitamin D, iron and magnesium. What’s so great about all those vitamins? Well, vitamin B6 reduces the chemical homocysteine in our bodies (which helps prevent heart attacks), vitamin C helps ward off cold and flu viruses in addition to producing collagen to help maintain skin’s youthful elasticity. Vitamin D plays an important role in our energy levels, mood, and builds healthy bones, heart, nerves and teeth. Iron helps produce red and white blood cells, builds a resistance to stress and is good for proper immune functioning. FINALLY, magnesium is the relaxation and anti-stress mineral (source). Get my point? 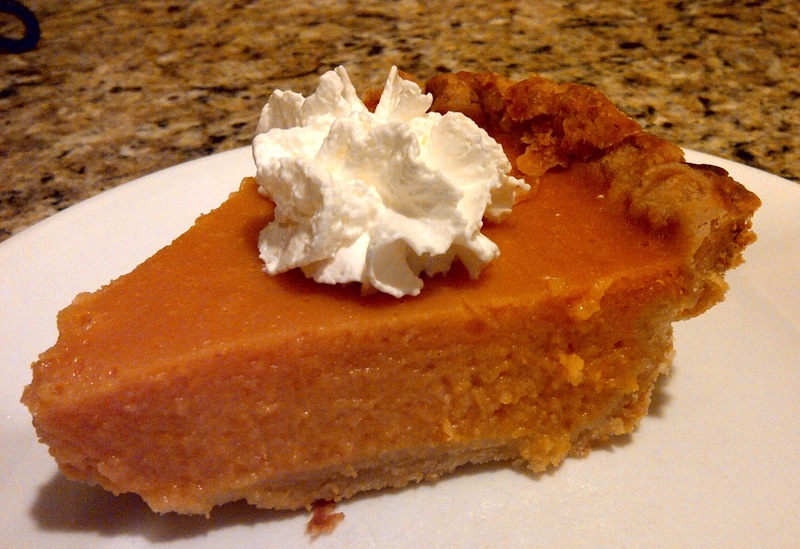 Sweet potatoes are good for you, so don’t feel too bad about eating that second slice of pie. Enjoy and HAPPY BIRTHDAY PAULA!! 2. FOR THE CRUST: Mix the first three ingredients together with a fork. Add the milk. Roll out onto cleaned surface lined with parchment paper and a little flour. Roll dough to form a circle, about 1/8-inch thick. Place dough onto pie plate and bake. 3. FOR THE FILLING: Cut sweet potatoes in 1-inch cubes. Cover with water. Bring to a boil and simmer for 15 minutes, or until soft. Drain potatoes. Using a potato masher, measure out 2 cups of mashed sweet potatoes. 4. In a blender, blend together sweet potatoes, eggs, butter, sugar, salt and vanilla. 5. 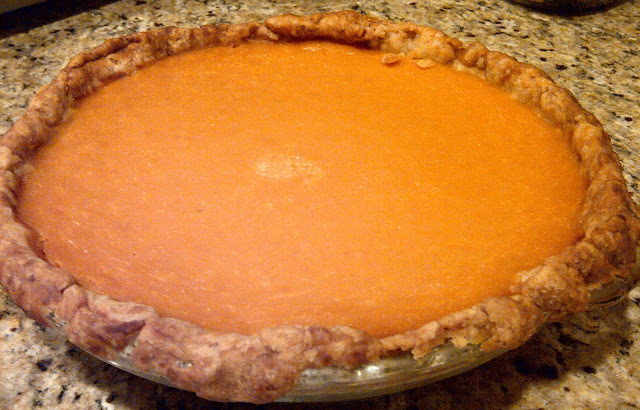 Pour filling into unbaked pie shell. Bake for 40-45 minutes or until set. Let cool completely, then garnish with Cool Whip.